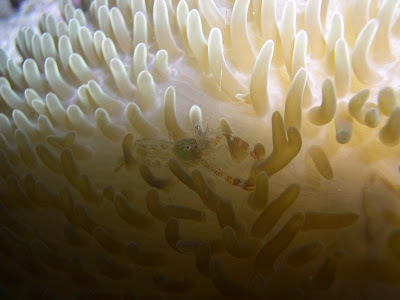 I found this Sun Anemone shrimp hiding on the underside of a Golden Sun anemone. Once he saw me he marched right out on top and posed for his picture. The shadow that he is in was caused by my underwater housing blocking the camera flash on macro. It usually is a problem but I like the effect in this shot. Bahamas Louie -- blog some more please! and tell us about your fascinating life -- do you go to school on Eleuthera? We were there last year and saw a kid playing at chicken eddies -- was that you?